I’ve recently bought an iPhone 4S in the UK, knowing that I’ll mainly be using it on my AT&T GoPhone prepay plan while I’m in the US. Let me show how it all works. There is an updated version of this article here. GoPhone is AT&T’s nationwide prepay mobile phone plan: you add call credit via vouchers or credit card and then enjoy unlimited texts and phone calls for only $2 per day – if you use your phone. It’s genius! You’re charged when you make or receive a domestic (US) phone call or you send a text. Incoming text messages are free. If you have a data add-on feature then you can use this without being charged. I think this is one of the most advanced and forward thinking plans I’ve come across on my travels. You can get GoPhones at Radio Shack or from AT&T’s shops which are plentiful. 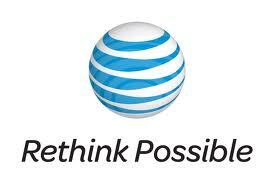 Be aware though that most AT&T stores are actually “authorised resellers” which means it’s a franchise. They have their own (made up) prices trying to make a living, so they may charge you for a GoPhone SIM. GoPhone SIMS at the time of writing (2012) are all standard sized, i.e. they won’t fit into an iPhone 4 or 4S. So you need an iPhone SIM cutter, readily available from Amazon. They’re about £5 and most come with free SIM adapters so you can use your cut SIM’s in regular devices too. You can get a GoPhone SIM from a shop just by itself, or you can buy one of those cute phones for $15 which come with a SIM. 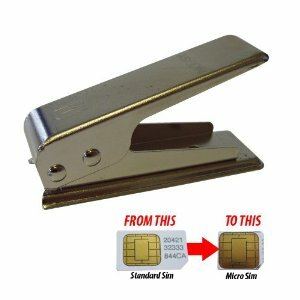 Now put your SIM Card Cutter to work and put the smaller sized card into your iPhone. You want to top up your card with a bit of cash of course, and you’ll also want to sign up with a Data Feature, like the 500MB for $25 package. You can do this by either calling 611 from your GoPhone (even if you don’t have credit this number still works), or by adding a package online at http://www.gophone.com. Obviously you also need an unlocked iPhone, or one that’s locked to AT&T in the US. OK – phone works, now how about data? Ah, the interesting part. Right now you’ll be able to make and receive phone calls, but even though you’ve signed up with a data package iPhone doesn’t quite know how to contact AT&T’s network for 3G yet. You’ll probably notice the absence of the 3G logo in the top left corner. Make sure you are connected to a WiFi network when you do the next step. You can even do this before you travel, however activating the AT&T settings will mean you won’t be able to access data anymore from your domestic carrier (just in case you’re at the airport ready to leave for the US and you’re on 3G… this will be the last thing you’ll do). In Safari, head over to http://www.unlockit.co.nz/ – that’s Craig Whitmore’s site, he’s figured out a way to add a new APN to your iPhone (which is a collection of data access settings) for most carriers around the world. Give the man a donation, he deserves it! Pick your country and carrier from the list (in our case, USA and AT&T), click install and your data settings are now up to speed for 3G data on AT&T with GoPhone. Nice! Please note that this is not a jailbreak, this does not invalidate your warranty, and these changes ARE reversible. All your doing is installing a new APN Profile onto your phone. You can only install one APN at a time. Nice one! Now I’m back home – how to I get rid of it? Just hit REMOVE to delete your APN. Easy! Head over to Settings – General – Profile, click the APN Carrier Settings and hit the big red REMOVE button. The AT&T Profile is now gone. You can now install another one from http://unlockit.co.nz. Alternatively you can see if your carrier allows to re-send the settings under Settings – Phone (scroll down the page and see if they’ve added their options). O2 in the UK have the option to resend your settings. Just when you thought it couldn’t get any better: I upgraded the the firmware to iOS 5.1 yesterday and now the display even shows AT& 4G in the top left corner. How exciting! I’ve tested the download speed previously and I don’t think it has physically changed, it’s just a different label they’ve implemented. Not sure if iPhone 4 will show this too or if it’s just the 4S. I also wonder if it’ll show 4G in the UK, where LTE hasn’t been rolled out yet. AT&T is one of the best networks I’ve used in my life: superb customer service, and amazing price plans. Very forward thinking. Check out their iPad plans too, they’re the only carrier I’ve heard of to offer International Data Plans, you can sign up directly from your iPad too. GoPhone is the best idea since sliced bread, in case you don’t fancy paying £2 per minute for a domestic phone call, or £6 per MB of data. Top up $100 and your number is safe for an entire year. Data Plans don’t renew automatically by default which is perfect for occasional users. i am heading back out to the states in december, i have a 4S on o2 in the uk, which network sim will work in side my phone? are any of them available naturally with a micro sim? 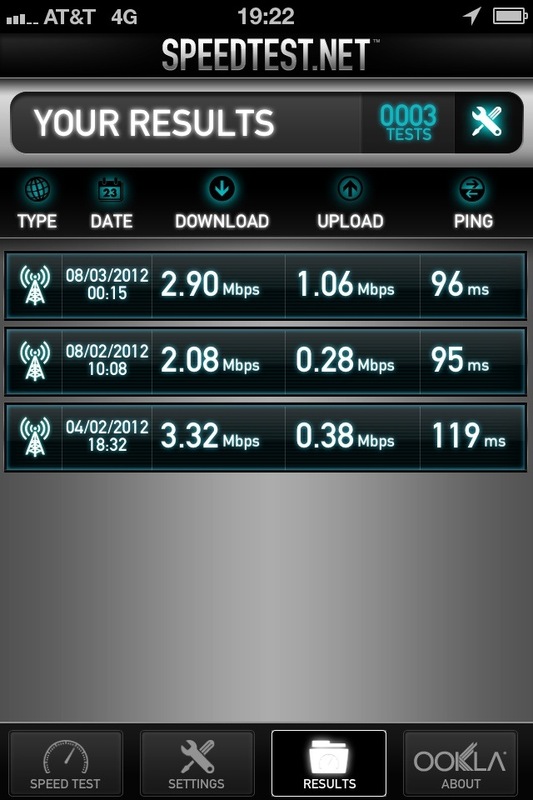 you’re in the same boat as me – I’m also with O2 UK. An AT&T SIM Card works fine, but when I got mine they didn’t have specific Micro SIM’s (I used a £5 cutter from Amazon – works great). They may have them now, pop into an AT&T store and ask them. 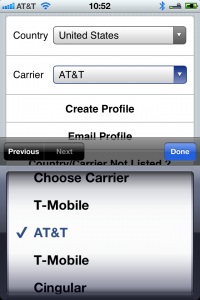 The other provider you can try is T-Mobile US, those are the only two that work with GSM 1900 and hence with SIM cards. Other providers (like Verizon, Sprint, etc) use CDMA and use different frequencies and hence different phones so those won’t work with your European iPhone. Needless to say your iPhone needs to be unlocked to work with anything other than an O2 UK SIM. Best check that before you travel.